This article is about the town. For the person it was named after, see Datu Piang. Datu Piang, officially the Municipality of Datu Piang, is a 2nd class municipality in the province of Maguindanao, Philippines. According to the 2015 census, it has a population of 25,600 people. It is formerly known as Dulawan. Datu Piang (fourth from left) with American officers, 1899. Datu Piang is politically subdivided into 16 barangays. Created as Dulawan on November 25, 1936 by Executive Order No. 66 of Pres. Manuel L. Quezon, the municipality covered a large area of what is now mostly central Maguindanao and northern Sultan Kudarat. It is among the first municipalities of the old Cotabato province. Republic Act No. 1035, enacted on June 12, 1954 renamed the town to Datu Piang, after an influential Muslim leader from the region during the American colonial period. 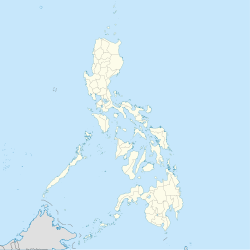 In 1959, a large southern territory was made into the municipality of Ampatuan. Four years later the municipality of Maganoy was carved out its territory, which later on became the capital of Maguindanao, of which it was made part of on November 22, 1973. Its remaining south-western barangays were merged with other barangays of Dinaig to form the municipality of Talayan in 1976. Its area was reduced again on July 1, 2003, when 14 of its south-eastern barangays were separated to form the municipality of Datu Saudi-Ampatuan. On July 30, 2009, upon the ratification of Muslim Mindanao Autonomy Acts No. 225 (as amended by MMAA 252) and MMAA 222 (as amended by MMAA 253), the municipalities of Shariff Saydona Mustapha and Datu Salibo, respectively, were created from a total of 5 entire barangays and portions of 10 barangays from Datu Piang, in addition to other barangays from Datu Saudi-Ampatuan, Datu Unsay, Mamasapano and Shariff Nopak. ^ National Statistical Coordination Board. "PSGC Interactive: Municipality/City: DATU PIANG". Archived from the original on 2008-11-19. Retrieved 2009-02-25. ^ "PSGC Updates (October - December 2008)". National Statistical Coordination Board. Archived from the original on 2009-11-13. Retrieved 2009-02-25. ^ "Datu Piang, Maguindanao : Average Temperatures and Rainfall". Meteoblue. Retrieved 19 January 2019. ^ Chan Robles Virtual Law Library (1998-07-19). "Republic Act No. 1035". Retrieved 2008-05-19. ^ University of California Press. "Muslim Rulers and Rebels: Chapter 5 - America's Moros". Retrieved 2008-05-19. ^ Chan Robles Virtual Law Library (1998-07-19). "Presidential Decree No. 1009". Retrieved 2008-05-18. ^ Philippine Statistics Authority (2008-04-16). "2007 Census of Population - ARMM" (PDF). Archived from the original (PDF) on 2008-09-05. Retrieved 2008-05-19.